Last year I reviewed Goodnight Goon by Michael Rex as one of my three favorite Halloween books (see the video HERE). This year I was browsing the library shelves when I found The Runaway Mummy, also by Michael Rex! These books were published in 2008 and 2009 resepctively, so I'm a bit late to the party, but they're such fun reads! My son and I had a good time reading the original stories first (as we do a few times throughout the year), and then read the petrifying parodies in October. Goodnight Goon is a parody of Goodnight Moon, with a little monster boy saying goodnight to various creepy things around his tomb. I'm not a big fan of the original Goodnight Moon (I know, gasp! What kind of mother am I, etc) but I do like this version with monsters and creepy crawlies added in. I really like that Michael Rex has made the illustrations look classic, like they could have been the original illustrations. The Runaway Mummy is by far my favorite. I love The Runaway Bunny in its original form, so I was really looking forward to the spooky adaptation. A boy mummy is trying to leave his mummy behind by changing into a sea serpent, gargoyle, and more, but his mummy always changes into something else to be near him. This one has a really great twist ending that made me chuckle, making it my favorite of the parodies. These are fun books to read for Halloween because kids can compare them to the originals, if they already know them. If not - read them aloud and then compare and contrast! 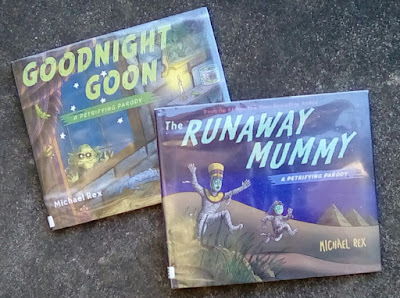 Activities like saying goodnight to everything in your child's room can be easily adapted to go along with Goodnight Goon, and thinking of spooky things to turn into with your child is a fun way to continue the story of The Runaway Mummy.